Linux.com Interview: Mark Micire of the Center for Robotic Assisted Search and Rescue at the University of South Florida. Mark Micire helps build and deploy the robots used to speed the search for survivors in the rubble of the World Trade Center. The CRASAR Lab that create these remarkable robots use Linux for most of their computing needs. Linux, and the geeks, researchers and professors who use it are speeding the development of critical technologies like USAR Robotics, technologies that help save lives. Linux.com got in touch with this lab in South Florida to get a closer look at who they are, what they do, and what they do it with. Credit for all photo media in this article goes to the Center for Robot-Assisted Search and Rescue. 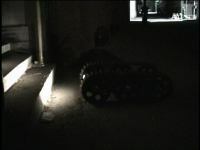 Contact Mark Micire at http://www.csee.usf.edu/robotics/crasar/ if you have further needs. Mark Micire is a graduate student at the University of South Florida CRASAR lab -- The Center for Robotic Assisted Search and Rescue. He's one of a team of four people led by Dr Robin Murphy who responded with 24 hours to the dramatic search and rescue presented to the nation on September 11th. The team has research interests in unstructured environments and victim detection. In addition, each member of the team is themselves formally trained in Urban Search and Rescue. Imagine for a second when this team of rescue academics from florida show up with a mass of robots, most packable by a human being, but as it turns out it is the smallest marsupial machines that really perform. Small, sturdy robots (about the size of a big loaf of bread) are the critters that can go down drains and squeeze through cracks, where no human can go, no matter how determined. It's possible these designs still proved the most adept at finding victims in the rubble. The robotocist teams are still at work on the rubble even today, though the mission has long been changed to analysis and inspection duties. Neverthless, for the days following September 11th, this first use of robots to help target victims is considered a dramatic success, as you may have already seen in the media. Anyway, turns out it's much more than just price that puts Linux into all these exciting robots. Mike Micire told us "Linux and robotics are very closely tied... You only have to go to a single robotics competition and see how many people are using Linux to understand." OK, so don't tell us twice, we know a Linux success story when we see one! Today Linux.com caught up with Mike Micire, now that he is 'back in the office' and asked him about the experience and about the robots he works with every day. Click through to read the interview and see the pictures of the team in action (with robots descending drains) and thanks for visiting Linux.com.